The volcano has registered a number of minor eruptions over the years, and no evacuations were ordered as scientific experts reported the activity was decreasing. 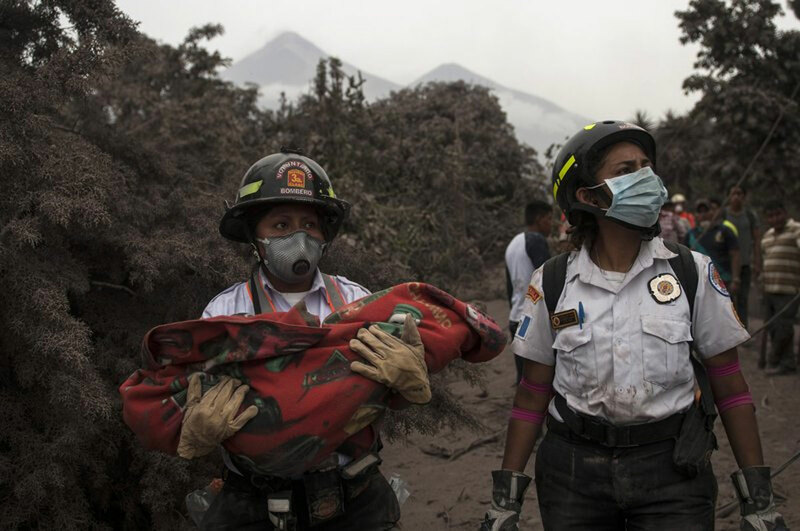 / Reporting SONIA PEREZ D.
Rescuers pulled survivors and bodies Monday from the charred aftermath of the powerful eruption of Guatemala’s Volcano of Fire, as the death toll rose to 62 and was expected to go higher from a disaster that caught residents of remote mountain hamlets off guard, with little or no time to flee to safety. Fanuel Garcia, director of the National Institute of Forensic Sciences, said 62 bodies had been recovered and 13 of those had been identified. Guatemala’s disaster agency, Conred, issued a number of standard precautions, advising people to wear protective face masks, clean their rooftops of ash once the eruption was over and cover any food and water intended for human consumption. It also said to heed any recommendations from authorities. Guatemala City’s international airport was closed due to the danger to planes. Conred spokesman David de Leon said that around 2 p.m. the volcano registered a new, more powerful explosion. Rafael Letran, a resident of El Rodeo, criticized Conred for not evacuating communities earlier. De Leon said the disaster agency followed protocol. “As soon as we received the information around 6 a.m. that the volcano was in an eruptive phase, the protocol was initiated to verify with different sectors and also talk to the communities, to community leaders. … We had the information from our scientific service, and they told us the trend was that the activity was diminishing,” he said. Emergency crews in helicopters managed to pull at least 10 people alive from areas cut off by the flows. Conred said 3,265 people had been evacuated.